Malaysia is centrally located within the Association of Southeast Asian Nations (ASEAN). Despite the 2017 being a challenging year, the construction industry in the country experienced steady growth, supported by ongoing construction and infrastructure projects. However, with Malaysia's carbon emissions reduction targets pegged at 40% by 2020 and 45% by 2030, diesel gensets are expected to foresee weak demand for rental purposes while gas gensets are anticipated to gain share in the overall Malaysia power rental market pie in the coming years. Amongst all the applications, construction and power utilities applications occupied major Malaysia power rental market share in 2017. In addition to $4.6 billion of capital investments allocated for transmission and distribution grid, an additional 9,171 MW of capacity is likely to be added via 12 new power generating projects by 2023. 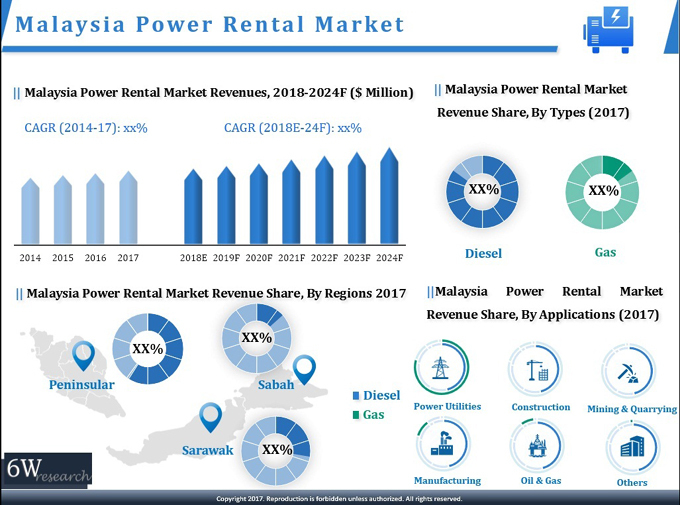 Some of the key players in Malaysia power rental market includes- Aggreko, Atlas Copco, Caterpillar, DynaSynergy, FG Generators, SP Energy, and WCM Power. The Malaysia power rental market report thoroughly covers the Malaysia Power Rental market by types, KVA ratings, applications and regions. The Malaysia power rental market outlook report provides an unbiased and detailed analysis of the Malaysia power rental market trends, opportunities/high growth areas, market drivers which would help the stakeholders to device and align their market strategies according to the current and future market dynamics. •	Historical Data of Malaysia Power Rental Market Revenues for the Period, 2014-2017. •	Malaysia Power Rental Market Size and Malaysia Power Rental Market Forecast of Revenues, until 2024. •	Historical Data of Malaysia Power Rental Market Revenues, By Types for the Period, 2014-2017. •	Market Size & Forecast of Malaysia Power Rental Market Revenues, By Types, until 2024. •	Historical Data of Malaysia Diesel Genset Rental Market Revenues for the Period, 2014-2017. •	Market Size & Forecast of Malaysia Diesel Genset Rental Market Revenues, until 2024. •	Historical Data of Malaysia Gas Genset Rental Market Revenues for the Period, 2014-2017. •	Historical Data of Malaysia Diesel Genset Rental Market Revenues, By KVA Rating for the Period, 2014-2017. •	Market Size & Forecast of Malaysia Diesel Genset Rental Market Revenues, By KVA Rating, Until 2024. •	Historical Data of Malaysia Gas Genset Rental Market Revenues, By KVA Rating for the Period, 2014-2017. •	Historical Data of Malaysia Diesel Genset Rental Market Revenues, By Applications for the Period, 2014-2017. •	Market Size & Forecast of Malaysia Diesel Genset Rental Market Revenues, By Applications, Until 2024. •	Historical Data of Malaysia Gas Genset Rental Market Revenues, By Applications for the Period, 2014-2017. •	Historical Data of Malaysia Diesel Genset Rental Market Revenues, By Regions for the Period, 2014-2017. •	Market Size & Forecast of Malaysia Diesel Genset Rental Market Revenues, By Regions, Until 2024. •	Historical Data of Malaysia Gas Genset Rental Market Revenues, By Regions for the Period, 2014-2017. •	Malaysia Power Rental Market Trends and Developments. •	Malaysia Power Rental Market Share, By Players. 15.2. Atlas Copco (Malaysia) Sdn. Bhd. 15.5. FG Generators Sdn. Bhd. 15.6. SP Energy SDN. BHD. 15.7. WCM Power Sdn. Bhd.